A visual investigation into mystery, tension, and storytelling. Dark, swooping landscapes of North Europe are what hinges the paintings of Danish artist Sif Nørskov. With brush strokes that are as intuitive as they are fleeting, the artist draws upon her own experiences to influence her works, that verge upon the imaginary. Although a painter, she is no stranger to photography, having naturally transitioned from this medium that nevertheless continues to shape her works through cropped composition. 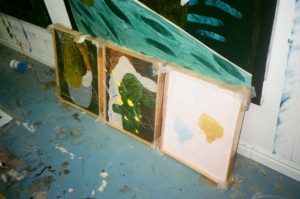 This aspect of Sif Nørskov’s paintings also comes from her interest in literature; cropped and therefore tantalisingly ephemeral, whilst revelling in mystery, these works indicate that the story is never finished, and collectively they form a storyboard of sorts, alluding to a sense of narrative, rather than literal representation. In this interview, the artist speaks about how she believes in the creative freedom of painting that, coupled with its diverse nature, poses a challenge that she finds irresistible. Working quickly, the paintings are deliberately less planned to accumulate the intrinsic tension Nørskov desires to evoke. To achieve this, the artist advocates responding visually, rather than analytically. Interestingly, the artist cements her works in the literary genre of ‘magical realism’, leading them to both enrich reality and suggest alternative worlds – depicted as cactuses, mountains or rock-like objects in gloomy and unlit surroundings. This new dimension is reflected in the thick materials Nørskov utilises, mentioned in the interview to be powder filler, glue, paper, fabric, acrylic and wood, amongst others. 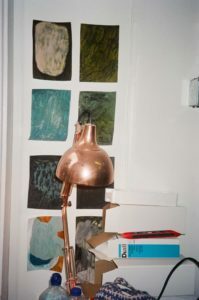 Nørskov also manipulates imagery to create hidden humour in her works. 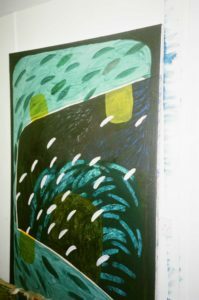 She reveals to us that these additions have flowed from an organic development of her practice, as she has come to establish her own language in painting. Sif Nørskov (b. 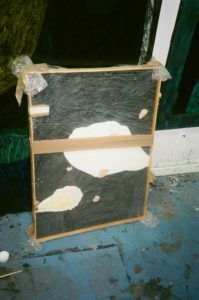 1992, Denmark) graduated from a BA Fine Art at Central Saint Martins, London; and an MA Painting at Royal College of Art, London. 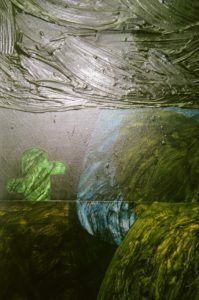 She has exhibited in Cob Gallery, London, Miranda Kuo Gallery, New York; Carlsberg Byens Galleri & Kunstsalon, Copenhagen; Kunstwerk Carlshütte Germany, amongst others. Sif Nørskov currently lives and works in London. Yes, I think so, it’s nice being part of something that unites artists from all over the world, and it helps you discover inspiring artists you might not have found yourself. Artpiq’s platform allows emerging artists to kick-start their career through visibility, funding, development of artistic practice, and transparent sales. What is your position on their ethos towards emerging art? I think it’s great, the art world does not offer a linear path like many other professions, so I think that providing some structure for emerging artists is very helpful. It also instills confidence in potential buyers. How has being part of Artpiq developed your confidence? Does this platform allow for you to concentrate on your practice without thinking about sourcing clients or the business side of the arts? It definitely helps with people being able to discover your art, which brings interest and opportunities. I think the founder genuinely cares about artists and their work, and this attracts attention from buyers who also genuinely care about art and artists, and not just the investment potential alone. Foggy landscapes or furry trees are often seen in your works. Would you agree in saying that these dark colours and brutal landscapes derive from your Danish upbringing? Yes definitely, but it is also derived from a romanticised perspective, as Danish landscapes are not as stereotypically Scandinavian as those of Sweden and Norway, where nature is more dramatic. I have always loved the brutal and dark landscapes of the north. In early childhood, I travelled to Iceland with my mum where I went to school for about a month, and the rough Icelandic landscape left a very big impression on me. In that sense, my paintings represent a form of imaginary landscape that draws upon inspiration from both the stereotyped landscapes of the north as well as the landscapes I grew up around. You studied photography before graduating in Fine Art and then specialising in Painting. 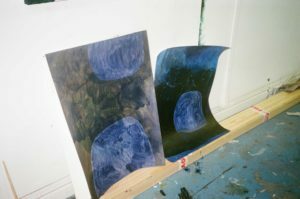 How has this transition been – from a digital medium to a traditional one – and do you approach painting from a photographic lens? In a way, it was quite a natural transition. Some of the first paintings I did in art school were based on photographs I had taken, and I continue to be inspired by the way in which photography always takes things out of context. 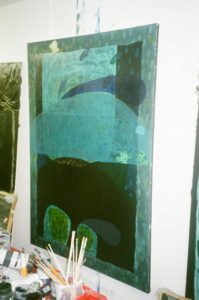 My paintings often appear to be crops of something, with shapes that appear to, in theory, extend beyond the edge of the canvas. This comes from my inspiration from literature where a story is never truly finished, it can always be extended and built upon. In terms of the transition from a digital medium to a traditional one, I think that I realised that with painting, because you are making something ‘from scratch’, rather than always pointing at something else, it is more diverse and provides more freedom creatively. This to me, also means that it is more challenging, but I think that that is what has kept me interested. Your overall painting process is quite quick and intuitive, however you are likely to let the works rest before you rework them. Can you develop on the quick vs slow contrasts in this decision-making stage? I have found that I produce the best works when they are less planned. Whenever I try to adhere to a sketch or a predetermined image, I find that what I produce lacks tension and is uninteresting. To me, working quickly means that I respond visually, rather than analytically. When I let the works rest for a while and return to them, I then consider what is already on the canvas and how I want to develop the work, whilst still allowing for this development to be somewhat intuitive. Layering is a dominant technique you enjoy. However, many of these coats of paint or paper are only recognisable on a closer look. Why are you inclined in this particular method? I enjoy producing something that doesn’t give itself away at first glance, as I personally like works of art that evoke curiosity, draws you in and surprises you. This also means that different individuals see different things in my works, which is important to me. Powder filler, glue, paper, fabric, acrylic, or wood are just some of the mediums you’ve previously employed. Can you tell us more about the process of transformation from one medium to another? Do they coexist in the same work or are they seen separately through series? I rarely intend to produce works in series, but this often happens naturally because I become interested in the possibilities of a certain medium for a while. I often use a specific medium because I want the paint I am using to behave in a certain way. On top of paper, which is a very smooth surface, I can achieve very distinct, gestural brushstrokes. By mixing powder filler and glue, I can achieve very thick textures that contrast with the thin flatness of painted paper, adding dimension to the painting. How has literature, in particular ‘magical realism’, shaped your perspective when painting. Are the works mediators of a fictional story, or are they essentially visually-driven? One of the most important things to me about my paintings is that I want them to sit somewhere between abstraction and representation. This is something that interests me in terms of how paintings that ‘resemble’ something can allude to a sense of narrative, rather than being literal illustrations. In the literary genre of magical realism, reality is enriched in a way that seems plausible, but at the same time, it can act as a form of escapism that suggests alternative worlds or ways of life. My interest in collage is also inspired by literature, as well as photography, where things are left out, either visually or theoretically, which adds an element of mystery. I am never basing a painting on a specific piece of literature, but they are often inspired the kinds of blurry, half-formed images that appear internally when reading a novel. In that sense, they are both mediators of fictional stories and visually driven. 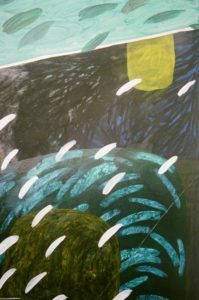 Your recurring motifs – cactuses, mountains, or rock-like objects – lie in between the abstract and the representational. Could these shapes be seen as fictional characters? Yes, I do see them as ambiguous characters of some kind, but they do not give themselves away completely. The cactuses that I paint are more obvious than the other ‘characters’, but they have a naivety about them and are often situated in dark surroundings that don’t quite fit with the usual aesthetic surrounding cactuses. This creates a tensions that I quite like, as I am interested in what happens when you place naive symbols within a dark, almost melancholic aesthetic. In terms of the size of your works, why are you inclined in intermingling a variety of scales, from small to large? What about the curation of these? I think that my paintings are ‘aware’ that they are paintings, because of their materiality and reference to the edge of the canvas, and in that sense, their size matters sculpturally. 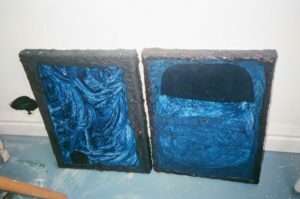 When curated, they form a kind of storyline, with each painting acting as a window that reveals a scene, place or event. They can therefore be curated in many different ways, and work both individually and in groups. You mentioned your works were filled with humorous connotations, which initially might not seem visible. Examples include your ‘Hairy Eyeball’, which is almost mocking the viewer. Can you develop on your initially ‘hidden humour’ further? Absolutely, I think it is something I would like to develop further. 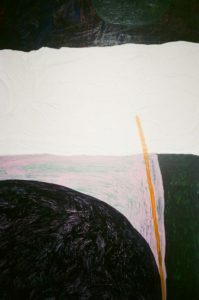 In ‘Hairy Eyeball’, which is a small, very simple painting that is mostly pink, two objects that appear to be abstract ‘blobs’ are floating in the middle. When turned upside-down, these resemble fists showing the middle finger. 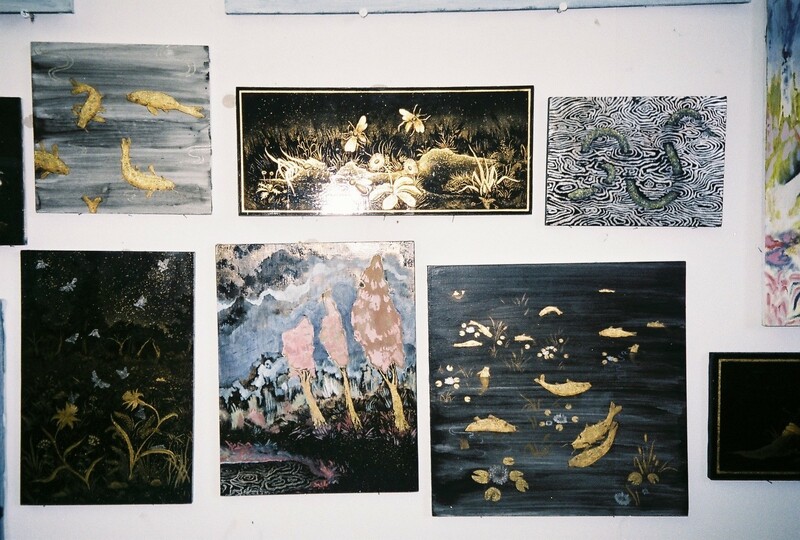 You’ve experimented with a variety of mediums, techniques and processes. Would you agree in saying that your practice is becoming more fast and intuitive? It has taken me a long time to develop my own language in painting, but it has now become more intuitive. When studying, I was mostly responding to what I was learning, but eventually I formed my own opinions and learnt what worked for me in terms of what I was trying to achieve. I now enjoy a faster method of working that allows me to develop within my own language, rather than feeling that each new painting has to reinvent my practice. Each of my paintings are still unique though, but the development of my practice has become more organic. Recently, you’ve started an Interior Design course. Why are you inclined in experimenting with design, and what’s next for you? For a while, I felt that something was lacking, and I found that whilst I love being creative, I also enjoy learning new skills and challenging myself technically. Interior design is an area that combines creativity, aesthetics, technical knowledge and business skills. I have found that when doing art alone and nothing else, you can become stuck when you are not taking in any new inspiration or learning new things. Thinking in three dimensions from a design perspective is obviously different to painting, but I think that it will impact my painting practice positively, and that my background in painting will be beneficial to my interior design practice as well, so I am excited about what the future holds.